It can be challenging to find fun ways to build fine motor skills but most kids will enjoy sewing for fun. This activity can be made with recycled materials which always makes our hearts happy and provides another lesson in ecology for the kids. 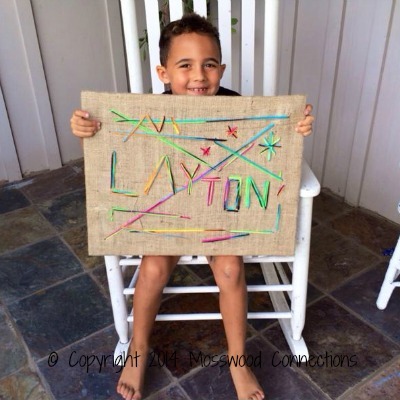 You can also recycle the project itself by pulling out the threads and reusing the burlap canvas. Sewing Helps Children Develop Fine Motor and Pre-Reading Skills! One summer day when we had lots of time, I found a nice piece of burlap in my craft supplies. It seemed like a nice day for the kids to sit outside and sew. So I took all the materials outside and invited them to start Sewing for Fun. I was actually a little surprised by how long this activity held their attention. Hand sewing skills not only helps to develop finger dexterity and the development of fine motor skills, but they also develop pre-reading skills. The motion that the eyes have when they are looking at the needle and thread while sewing is visual tracking; a critical skill for reading fluency. There are many ways that you can enjoy this activity: as a simple sewing project, a way to practice letters or even as a cooperative game! Take an old canvas or picture frame. Remove either the canvas or the glass. 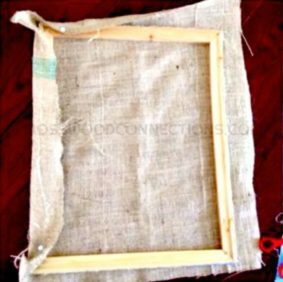 Take a piece of burlap and stretch it tightly over the frame. Staple or tack it to the back of the frame. 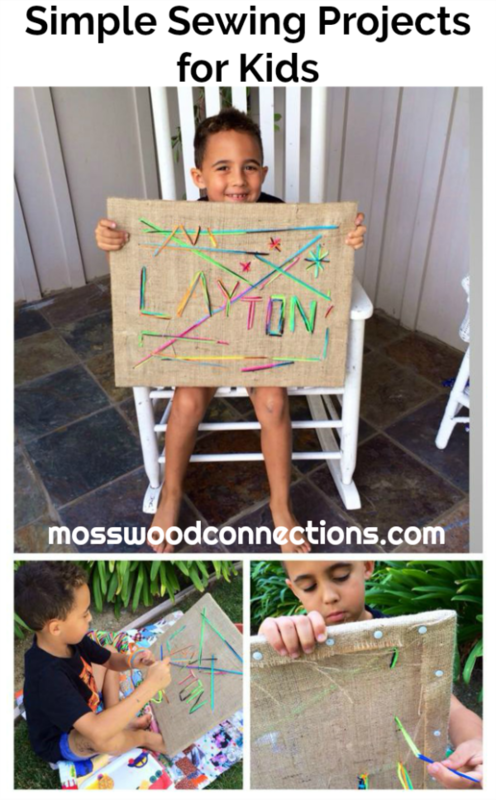 Learning Letters: You can write letters or draw shapes on the burlap for the child to sew over. Sewing as a Cooperative Art Activity: In a group situation, you can create a cooperative sewing game. Give each child a burlap covered frame. 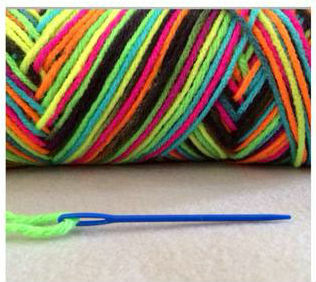 Give each child a different colored yarn. Put a timer on for 4 – 5 minutes. When the timer goes off hand your canvas to the person on your left and then have them sew on that canvas. Repeat until each canvas has been passed to each child. Have the kids make a cute little Cupcake Purse. It’s simple enough for children to sew. Tap into your child’s creativity and have them design and hand sew an adorable Felt Monster. Make a Snazzy Jazzy Button Bracelet. Make some Adorable Little Felt Forest Friends, you can turn them into keychains or some wonderful Christmas tree ornaments. Free template to make it even easier for you. Sewing Cards Made from Recycled Greeting Cards: Great for preschoolers and children in the early school years, these cards become a great busy bag filler or quiet play activity.